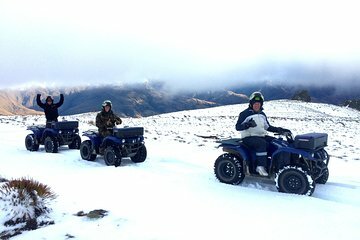 Enjoy high-octane thrills in the New Zealand wilderness on this 2-hour Cardrona Valley quad bike experience from Wanaka. Following a comprehensive safety briefing, pull on your helmet and hop onto your 350cc quad bike. Master the controls in safety, then spin off into the mountains of the mighty Cardrona Valley with your guide. Navigate winding dirt tracks through rolling alpine farmland where Merino sheep and cattle graze. Bounce and roll over the rugged terrain, and enjoy panoramic views over the wilds of New Zealand’s South Island. Please dress warmly, wear sturdy and closed-toe footwear.